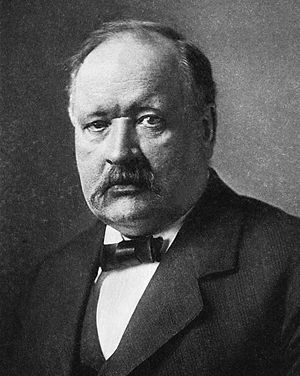 Svante August Arrhenius (February 19, 1859 – October 2, 1927) was a Swedish chemist and one of the founders of the science of physical chemistry. He determined that reactions in living organisms and in the test tube follow the same laws. In addition, he contributed to the fields of geology, astronomy, and astrophysics. He thought of the idea of a universal language, proposing modifications to the English language. The Arrhenius equation and the lunar crater Arrhenius are named after him. Arrhenius was born at Vik, in the Kalmar district near Uppsala, Sweden, the son of Svante Gustav and Carolina Thunberg Arrhenius. His father had been a land surveyor for Uppsala University, moving up to a supervisory position. At the age of three, Arrhenius taught himself to read, despite his parents' wishes, and by watching his father's addition of numbers in his account books, became an arithmetical prodigy. In later life, Arrhenius enjoyed using masses of data to discover mathematical relationships and laws. At age right, he entered Cathedral School in Uppsala, starting in the fifth grade, distinguishing himself in physics and mathematics, and graduating as the youngest and most able student in 1876. At the University of Uppsala, he was unsatisfied with the chief instructor of physics, Robert Thalen, whose interests lay in spectral analysis, a topic Arrhenius did not wish to pursue. Since Thalen was only faculty member who could have supervised him in chemistry at Uppsala, he was permitted to study at the Physical Institute of the Swedish Academy of Sciences in Stockholm under the physicist Erik Edlund in 1881. His work focused on the conductivities of electrolytes. In 1884, based on this work, he submitted a 150-page dissertation on electrolytic conductivity to Uppsala for the doctorate. His viewpoint did not impress the professors, as it stood against the common wisdom of the time, and he received the lowest possible passing grade. Such a low grade did not qualify him to teach at the university level. Later this very work would earn him the Nobel Prize in Chemistry. Of the many theses put forth in the 1884 dissertation, most would still be accepted today unchanged or with minor modifications. The most important idea in the dissertation was his explanation of the fact that neither pure salts nor pure water is a conductor, but solutions of salts in water are. Arrhenius' explanation was that in forming a solution, the salt dissociates into charged particles (which Michael Faraday had given the name ions many years earlier). Faraday's belief had been that ions were produced in the process of electrolysis; Arrhenius proposed that, even in the absence of an electric current, solutions of salts contained ions. He thus proposed that chemical reactions in solution were reactions between ions. For weak electrolytes this is still believed to be the case, but modifications (by Peter J. W. Debye and Erich Hückel) were found necessary to account for the behavior of strong electrolytes. In an extension of his ionic theory, Arrhenius proposed definitions for acids and bases. He believed that acids were substances which produce hydrogen ions in solution and that bases were substances which produce hydroxide ions in solution. The dissertation was not very impressive to the professors at Uppsala, but Arrhenius sent it to a number of scientists in Europe who were developing the new science of physical chemistry, such as Rudolf Clausius, Wilhelm Ostwald, and J. H. van 't Hoff. They were far more impressed, and Ostwald even came to Uppsala to persuade Arrhenius to join his research team. Arrhenius declined, however, as he preferred to stay in Sweden for a while (his father was very ill and would die in 1885) and had received an appointment at Uppsala. Arrhenius received a travel grant in 1885 from the Swedish Academy of Sciences, which enabled him to study with Ostwald in Riga (now in Latvia), with Friedrich Kohlrausch in Würzburg, Germany, with Ludwig Boltzmann in Graz, Austria, and with van't Hoff in Amsterdam. In 1889, Arrhenius explained the fact that most reactions require added heat energy to proceed by formulating the concept of activation energy, an energy barrier that must be overcome before two molecules will react. The Arrhenius equation gives the quantitative basis of the relationship between the activation energy and the rate at which a reaction proceeds. This explains the changes in reaction rates as the temperature increases. He was married twice. First to Sofia Rudbeck, a former pupil and assistant, who bore him one son, Olof Wilhelm. The marriage lasted only two years from 1894 to 1896, ending in divorce. In 1905, he married Maria Johansson, who bore him two daughters, Ester and Anna-Lisa, and a son, Sven. In 1901, Arrhenius was elected to the Swedish Academy of Sciences, against strong opposition. In 1903, he became the first Swede to be awarded the Nobel Prize in chemistry. In 1905, upon the founding of the Nobel Institute for Physical Research at Stockholm, he was appointed rector of the institute, the position where he remained until retirement in 1927. Eventually, Arrhenius' theories became generally accepted and he turned to other scientific topics. In 1902 he began to investigate physiological problems in terms of chemical theory. He determined that reactions in living organisms and in the test tube followed the same laws. In 1904, he delivered at the University of California a course of lectures, the object of which was to illustrate the application of the methods of physical chemistry to the study of the theory of toxins and antitoxins, and which were published in 1907 under the title Immunochemistry. He developed a theory for the origin of life on earth, known as panspermia, in which life in the form of spores is transported through interstellar space by light pressure. He even postulated that life on earth may have come from Venus, connecting the survival of some forms of bacteria at high temperatures with conditions on that planet. The theme of panspermia was later revived by astrophysicist Fred Hoyle in the last decades of the twentieth century. He thought of the idea of a universal language, proposing a modification of the English language. In his last years he wrote both textbooks and popular books, trying to emphasize the need for further work on the topics he discussed. These included Quantitative Laws in Biological Chemistry (1915), Worlds in the Making: The Evolution of the Universe (1906), and The Destinies of the Stars (1915). In September 1927, he came down with an attack of acute intestinal catarrh. He died on October 2 and was buried in Uppsala. Svante Arrhenius developed a theory to explain the ice ages, and first speculated that changes in the levels of carbon dioxide in the atmosphere could substantially alter the surface temperature through the greenhouse effect He was influenced by the work of others, including Joseph Fourier. Arrhenius used the infrared observations of the moon by Frank Washington Very and Samuel Pierpont Langley at the Allegheny Observatory in Pittsburgh to calculate the absorption of CO2 and water vapor. Arrhenius' painstaking calculations were later shown to be erroneous. Using the just published Stefan Boltzmann law he formulated his greenhouse law. This postulate is still considered valid. Arrhenius' high absorption values for CO2, however, met criticism by Knut Ångström in 1900, who published the first modern infrared spectrum of CO2 with two absorption bands. Arrhenius replied strongly in 1901 (Annalen der Physik), dismissing the critique altogether. He touched the subject briefly in a technical book titled Lehrbuch der kosmischen Physik (1903). He later wrote Världarnas utveckling (1906), German translation: Das Werden der Welten (1907), English translation: Worlds in the Making (1908) directed at a general audience, where he suggested that the human emission of CO2 would be strong enough to prevent the world from entering a new ice age, and that a warmer earth would be needed to feed the rapidly increasing population. Arrhenius clearly believed that a warmer world would be a positive change. From that, the hot-house theory gained more attention. Nevertheless, until about 1960, most scientists dismissed the hot-house/greenhouse effect as implausible for the cause of ice ages as Milutin Milankovitch had presented a mechanism using orbital changes of the earth (Milankovitch cycles), which has proven to be a powerful predictor of most of the millions of past climate changes. Nowadays, the accepted explanation is that orbital forcing sets the timing for ice ages with CO2 acting as an essential amplifying feedback. Arrhenius estimated that a doubling of CO2 would cause a temperature rise of four to six degrees Celsius or seven to 11 degrees Fahrenheit. Arrhenius expected CO2 doubling to take about 3000 years. Since Arrhenius's time, however, industrial carbon dioxide levels have risen at a much faster rate. Doubling of carbon dioxide concentrations is now predicted to take about a century. ↑ "On the Influence of Carbonic Acid in the Air Upon the Temperature of the Ground," Philosophical Magazine 1896(41): 237-76. Retrieved February 22, 2008. This page was last modified on 6 November 2015, at 23:48.